Today the Colour Monster is feeling very mixed up. He's yellow, blue, red, black and green all at once. Can you help him sort himself out? 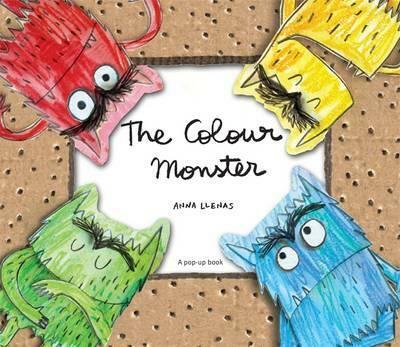 A stunning pop-out adventure that explores colours and feelings in a fun and gentle way. This is a special book to share with a child and enjoy looking at, albeit very carefully! Though the concept of bottling up feelings might be a little problematic, parents and teachers could certainly use this book to spark discussion about different feelings and perhaps help children understand them a bit more. It might lead to talk about other feelings too, such as what colour would represent boredom - perhaps brown or grey? Anna Llenas was born in Barcelona. She graduated in Advertising and Public Relations at the Autonomous University of Barcelona, with a diploma in Graphic Design by The Escola de la Llotya and has a postgraduate degree in Creative Illustration from the Escola Eina. She has developed graphic projects for clients as diverse as La Vanguardia (the Spanish daily newspaper), Nestle and the Government of Catalonia. She has collaborated with other authors as an illustrator. this picture book is her first as both author and illustrator.